(Tallahassee, FL) Citing today’s Magnitude 6.0 Northern California earthquake, the nonprofit Federal Alliance for Safe Homes (FLASH) urges residents in 42 USGS-identified earthquake states to take immediate action to prevent injuries, property damage, and post-earthquake fires. According to the U.S. Geological Survey (USGS), “While all states have some potential for earthquakes, 42 of the 50 states have a reasonable chance of experiencing damaging ground shaking from an earthquake in 50 years (the typical lifetime of a building). Scientists also conclude that 16 states have a relatively high likelihood of experiencing damaging ground shaking. These states have historically experienced earthquakes with a magnitude 6.0 or greater. The hazard is especially high along the west coast, intermountain west, and in several active regions of the central and eastern U.S., such as near New Madrid, MO, and near Charleston, SC. The 16 states at highest risk are Alaska, Arkansas, California, Hawaii, Idaho, Illinois, Kentucky, Missouri, Montana, Nevada, Oregon, South Carolina, Tennessee, Utah, Washington, and Wyoming.” USGS published new national seismic hazard maps last month. Support ceiling fans and light fixtures using bracing wire secured to a screw eye embedded at least an inch into the ceiling joist. Anchor the tops of bookcases, file cabinets, and entertainment centers to one or more studs with flexible fasteners. Secure loose shelving by fastening screws into the cabinet or with museum putty placed at each corner bracket. Secure china, collectibles, trophies, and other shelf items with museum putty. Secure televisions, computers, and stereos with buckles and safety straps that also allow easy removal and relocation. Install latches on cabinet doors to prevent them from opening and spilling out contents. Hang mirrors, pictures, and plants using closed hooks to prevent items from falling. Cover windows with approved shatter-resistant safety film to protect against broken glass. Ensure appliances have flexible gas or electrical connections. Strap the top and bottom of a water heater using heavy-gauge metal strapping secured to wall studs. Relocate flammable liquids to a garage or outside storage location. More free information and videos are available online at flash.org, www.youtube.com/stronghomes, and QuakeSmart. Technical information is derived from FEMA document E-74 Reducing the Risks of Nonstructural Earthquake Damage. QuakeSmart is a FEMA National Earthquake Hazards Reduction Program (NEHRP) initiative to help businesses in at-risk communities implement mitigation actions in addition to basic preparedness activities, such as creating and exercising disaster plans, preparing disaster supply kits, and knowing how to Drop, Cover, and Hold On (www.ShakeOut.org). It’s been 10 years since Hurricane Charley tore through Punta Gorda on Florida’s Gulf Coast – a Category 4 monster that was the strongest to hit the U.S. since Andrew in 1992. Punta Gorda homeowner Jim Minardi survived Charley, but he isn’t about to throw any anniversary parties. The August 2004 storm pummeled his 43-year-old home, shearing off the roof, blowing out windows and trashing all of his possessions. Fortunately, he and his dogs were unhurt, and his partner, Teresa Fogolini, was out of town. When the storm was farther south around Sanibel Island, Jim thought he could make a run for it out of the area. After all, Charley was a Category 1 storm with winds below 100 mph at that point. But, as hurricanes often do, it grew more fierce. By the time it churned through Charlotte Harbor, Charley packed a lot more muscle. By then, it was too late to leave. Jim hunkered down in a windowless interior bathroom and waited. There was little damage to his home before the calm of the eye passed over. So during “halftime,” as he puts it, Jim went to a neighbor’s shuttered home to wait out the rest of the storm. It was the back end of the storm that ripped into Jim’s home – and his roof crashed into that same neighbor’s pool screening. 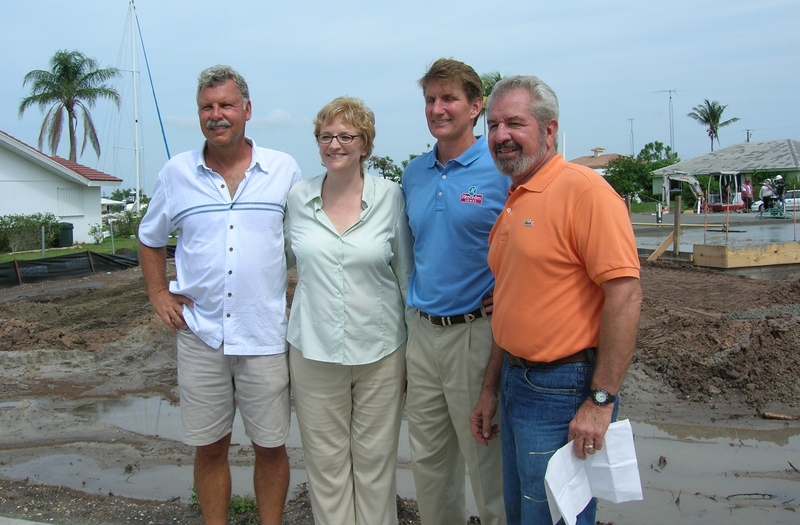 Thanks to interest from Home Improvement expert Bob Vila and FLASH, one year later, Jim and Teresa were in a new home built to state-of-the-art building codes and hurricane protective measures. You can see the before-and-after and what was done to bolster their new home’s safety in this “Tale of Two Homes” video. Despite a much more hurricane-resistant home, the Charley ordeal and aftermath left Jim wiser – and worried during hurricane season, particularly for people with older homes. Retrofit, retrofit, retrofit as much as possible, he urges those homeowners. Roofing tie downs and hurricane shutters are “cheap insurance,” Jim says. The rebuilt home has impact-resistant windows, so Jim believes he can forego shutters. There’s one thing he considered adding to the new home: a safe room. Punta Gorda officials pointed out it would only be useful for tornadoes, not hurricanes, because the home’s waterfront location made it vulnerable to rising waters from storm surge. Officials warned that Jim and Teresa should always consider evacuation because they could drown if they stayed behind in a hurricane. So, given that his home is much sturdier than the previous one, would Jim leave or go through another storm? “I ask myself that all the time,” he says. While he believes the reinforced home would withstand the impact, the trauma of what he endured with Charley lingers. Find more information about hurricanes and how to protect your home at flash.org. Editor’s Note: Terry Sheridan is an award-winning journalist who has more than 30 years of experience in reporting and editing for newspapers in the Chicago and Miami areas. She covered the aftermath of Hurricane Andrew’s devastation in 1992 in South Florida, and has experienced damage to her own homes from two hurricanes. She now lives in New Hampshire.